For the most part, I am designing this monksbelt at the loom. Even so, I have guidelines regarding color order, sequence of tabby and pattern colors, and treadling order. Each time I remove the temple, I make mental notes for the upcoming segment. When I advance the warp, I step back to get a better idea of where I’ve been, and where I want to go. Two tabby picks of blue 16/2 cotton are between each Fårö wool pattern pick. Purple wool weft is carried up the selvedge a short distance under the blue wool weft . The challenging part is the weft rep tabby. 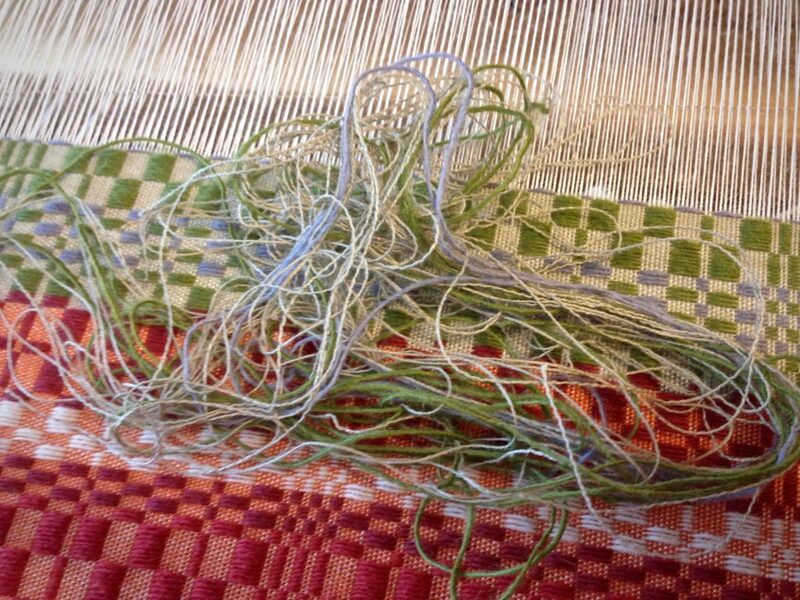 I make a high arch with the tabby weft, and change sheds before beating the weft in. Inconsistency shows up as streaks, especially with darker weft, like the blue tabby I’m on now. 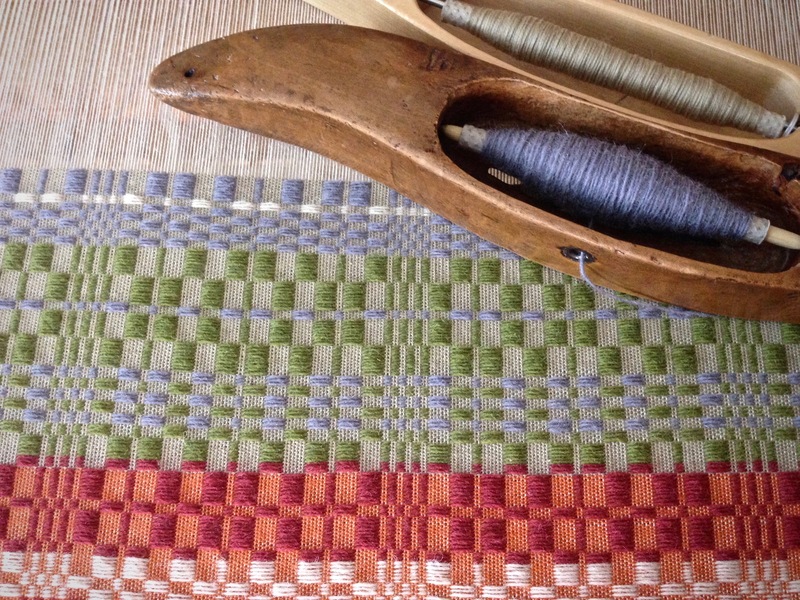 When it seems like too much effort to get it right, I have to remember that I am not just making yardage; I am developing skills and habits for successful weaving. The intensity of saturated colors provide high contrast. Lavendar wool appears gray when deep purple and dark blue are introduced. It takes planning and caring to build a home. It takes wisdom. Homes are built with wisdom. It’s like designing at the loom. We can’t see into the future, but we can set guidelines that help us make a good design. There is always a challenging part, in every stage. All the more reason for consistency in our convictions. Home is not just a place. Home is where we learn to love. May your home be your family’s favorite place. Your selvedges look wonderful! I have a temple and I will have to try using it on my next project. What is your plan for the yardage? It’s going to be luscious. Hi Debbie, Thank you! Selvedges always have a weaver’s attention, don’t they? It’s the paradox of trying to improve selvedges, while resisting fiddling with them. Using a temple is standard weaving procedure for me. I feel lost without one. This time, I have no immediate plan for the fabric. I wanted the freedom to weave and let the design take me where it will. After it comes off the loom I will decide what it’s good for. Or, I’ll put it away, and find it later when I need some fabric, and this happens to be perfect! That sounds like fun to me. Wind a narrow warp. Tie the lease cross. For a long warp, tie a choke tie about every meter. Put the end loop of the warp on the warp beam tie-on bar. Insert lease sticks in the cross. Tie the sticks together; or tape them together with masking tape. Remove tie around lease cross. 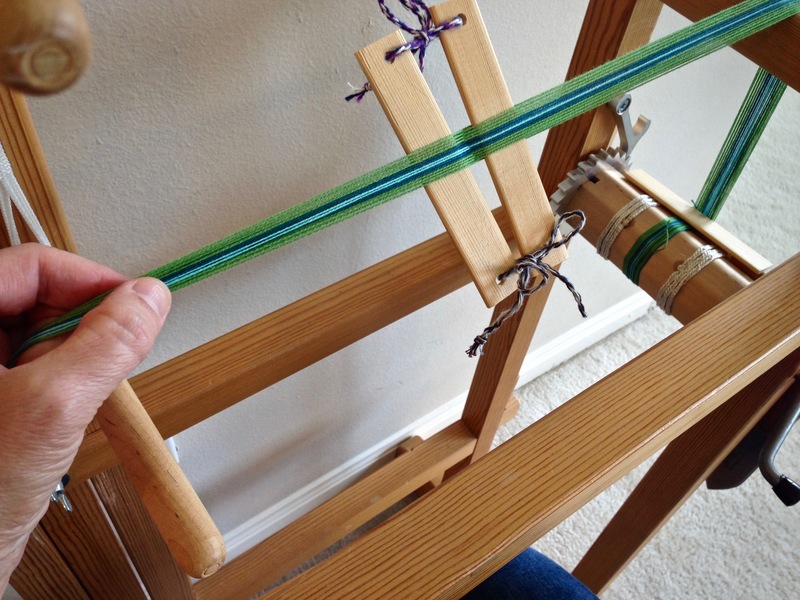 Hold the warp taut with the left hand while winding on with the right hand. Insert warping slats around the beam the first time around, and then every other time around after that. Wind on until the beginning of the warp is a few inches in front of the heddles. Tie or tape the lease sticks to the back beam. Cut the loops at the front end of the warp. Thread the heddles, alternating between the heddles on the right and on the left. Hold the warp taut and depress each treadle to check for any crossed threads. Tie the warp onto the front tie-on bar. May you go the extra mile to add special little details. Thanks for posting this, Karen. It was really interesting and informative. I like the added little touches like a woven tab for hanging too. Hi Alaa, It makes me happy to know this was interesting and informative to you. Adding special touches is one of the great advantages of making things by hand! Hi Karen! Your post and video came at the perfect time as we just finished Vavstuga Basics today. I have a band loom at home that I haven’t used yet, and 2 students purchased theirs today before leaving Vavstuga. Your wonderful blog was discussed several times around the dorm table this past week. Even Bettie said how timely today’s blog posting was! Thank you for sharing with us!! Wow, Geri, Are you serious?! What a wonderful co-incidence! I am delighted beyond measure that I could have some small part in bringing a helpful tidbit to Vavstuga Basics. Thank you for letting me know.You and your Vavstuga Basics friends have totally made me smile. What a great loom! I can imagine advantages over the more traditional designs: standing, treadles, cloth and warp beams. How interesting that you weave on it what I would consider sideways. Hi Weaver Grace, Good observations. (I do weave on the band loom sitting down. You probably can’t tell that from the video.) The two primary reasons I prefer this band loom over my inkle loom is 1) I can weave much faster and 2) I can put on a longer warp (I’ve done up to 10 meters). Weaving sideways is quite awkward at first; but, with practice, your hands become fluent. I always enjoy your blog posts. You are inspirational both in weaving and spirituality. Far be it from me to convince you that you *need* something you want. I have a hunch you will be able to convince yourself. 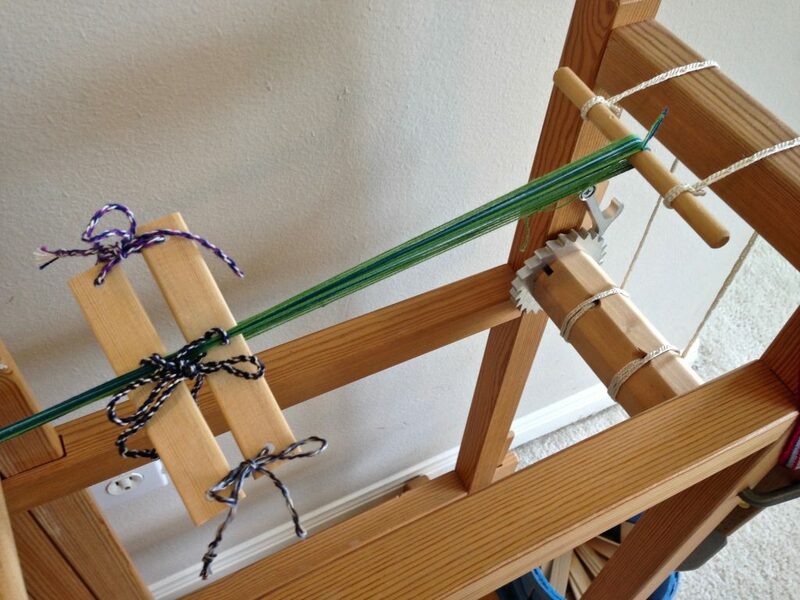 The advantage of an inkle loom is that you can travel with it, which I do. So, one for travel, and a stationary one for home. More weaving over all. That can’t be a bad thing! Thanks for your incredibly kind words. That really touches me! I see you have one of the “new” band looms Glimåkra has changed the band loom slightly since I purchased mine…nothing of consequence excepting the heddles—mine are string not Texsolv. My question is where did you get the delightful shuttle? I bought my band loom second hand. I’m not sure what year it was made, but I know the newer Glimåkra band looms have ratchets that are a little different than mine. String heddles? That’s interesting. My husband carved the shuttle for me. It’s modeled after an old Swedish band loom shuttle that we had seen. Mine uses string because it predates Texsolv!! As do I 🙂 I also carve so I guess I guess I will go the same route. I really like the idea of one handed operation so that the ‘dance’ involves all four limbs. Hugh, it is a great “dance” for the hands and feet. I will send you an email with specs for the shuttle in case you decide to carve one for yourself. Like Geri, who commented earlier, I was at Vavstuga last week! 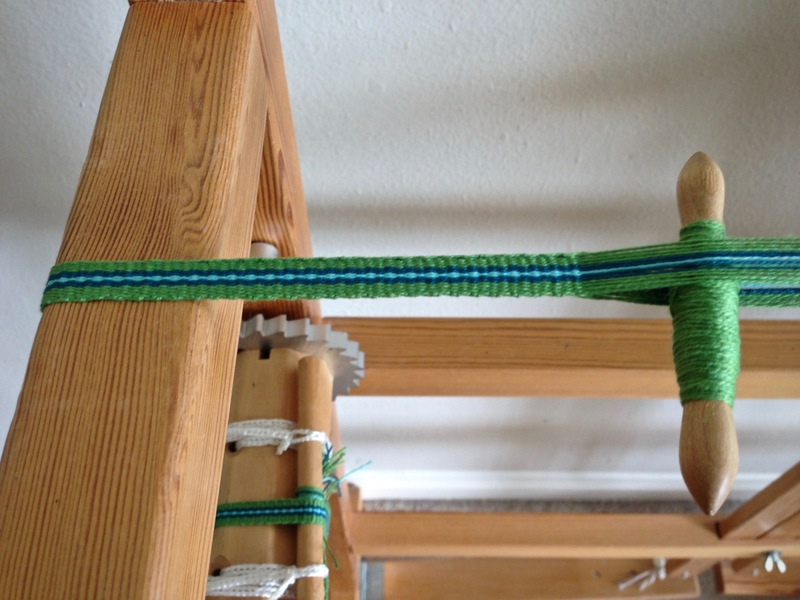 I bought a band loom like yours and then, the next morning, we saw this post about how to use it! Such serendipity! Thanks for the clear instructions! Hi Kerry, I couldn’t be more pleased that my instructions came at such an opportune time! You are going to enjoy that new band loom! Hi Debbie, if I remember correctly, the Shaker tape looms were a different design, but similar function. And they certainly produced miles and miles of bands! Thank you Karen! I want to use my band loom more but it was a little daunting. This post really helped. I think the only thing I need to work with is how tight to have the warp. I think I have it too tight. I will put on a warp this week and just sit and practice! Hi Anne, I am so happy that this post was helpful to you! You are right–practice is the best way to learn this. It takes a while before it’s comfortable. But once it takes off for you, it’s a lot of fun. I am the other Vavstuga student who purchased a band loom which coincided with your post! I can’t express how happy I am it happened that way. Directions with the loom were sooo… minimal! Yesterday I got together with the other band loom buyer from Vavstuga and we helped each other get started. We referred to your post as we warped and then began to weave. What fun! I don’t think we could have done it without you. Great directions, photos and video! My mind is stirring up other uses for the bands. Wow, Ann, that’s fantastic! I couldn’t be more thrilled that things worked out this way! Thank you so much for telling me your story. It makes my heart sing. Awesome little machine and great video, it was great to see some one using one of these looms. 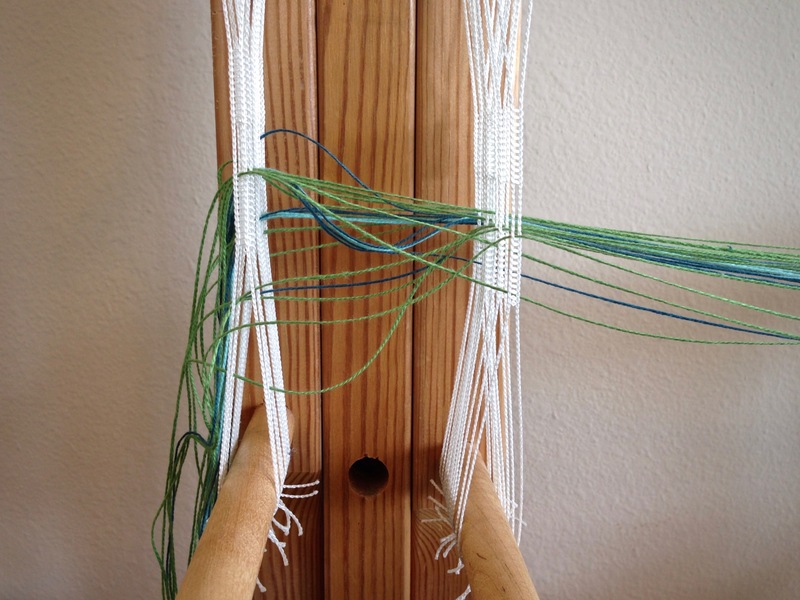 I just got into inkle looming and the thing that up sets me is the amount of yarn that goes to waste when it reaches the heddles is this loom any better in that respect? Good question! I think I end up with about 10 inches/25 cm of loom waste at the end, which is probably not much better than the inkle loom. However, I can put on a much longer warp, so the percentage of loom waste overall is much less. I’ve done as long as 10 yards/9 meters. In that case, the loom waste didn’t count for much. I want to thank you for this post. 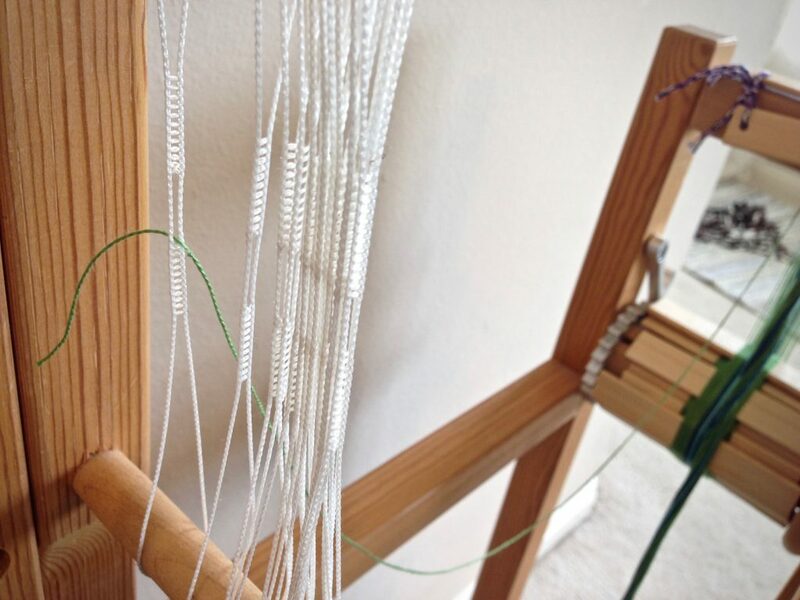 I was inspired to purchase a band loom after reading this post several months ago. Without your instructions and video I would have really struggled to figure out the easiest way to warp this loom. As Ann commented the instructions that come with the loom are very minimal to state it kindly. I looking forward to bands to use for straps and tabs! Bless you for sharing your knowledge! Hi Ruth, I’m so glad! I hope you enjoy weaving on your band loom as much as I do on mine. There are so many uses for the bands! In a few weeks, a very similar bandloom from Glimakra will move in with me. Your comments on how to prepare the warp, come to me as called (I also found another, but it seems to me more complicated). Thanks a lot for this. Hi Julia, Hooray! You have much to look forward to with your band loom. Thank you so much for writing this post. I am new to band weaving and your tutorial will provide me with guidance as I get my new loom warped! I would also love the specs for your band shuttle if you still have them. Thank you again and again! Hi Ashlee, I’m so glad you found what you need here! I’m happy to send you the specs for the band shuttle. Watch for an email from me. I almost kept going. But something was off. Maybe the tabby hadn’t been beaten in as tight between the lavender pattern picks. In that case, a few more rows would obscure the slight difference. I did not want to undo; and wishful thinking tempted me to avoid taking a closer look. Sensibility won, though. I did stop to examine the cloth. 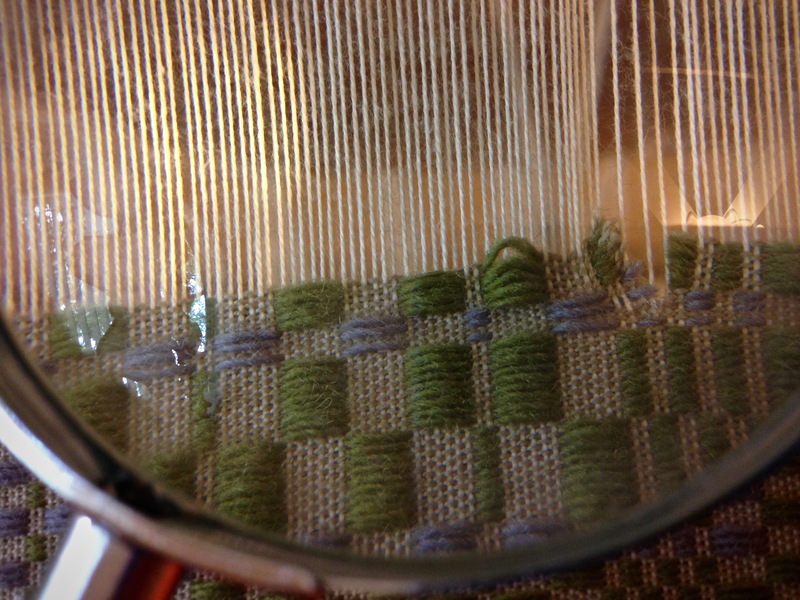 Weft threads are carefully snipped back to the point of error. I did this very slowly, with a bright light shining on the area being snipped. Even under close inspection, my eyes could not identify the error. I struggled to see the fine details. Magnifying glass to the rescue! Magnification revealed two extra tabby picks. Aha! Two fine threads out of place are enough to throw off the pattern. If not corrected, this errant line across the finished cloth would draw the attention of every eye. Knowing precisely where the error is gives me courage to face the necessary operation. Snip, snip, snip. Undo. Fresh start. Magnifier reveals two extra tabby picks (16/2 cotton) that must be removed. Weft threads are pulled out one by one, and then discarded. An honest report tells it like it is. When we are trusting the Lord, we have courage to stop and examine errors, bypassing wishful thinking. Faith is like a magnifying glass that enables us to see clearly. Courage comes alive through the eyes of faith. 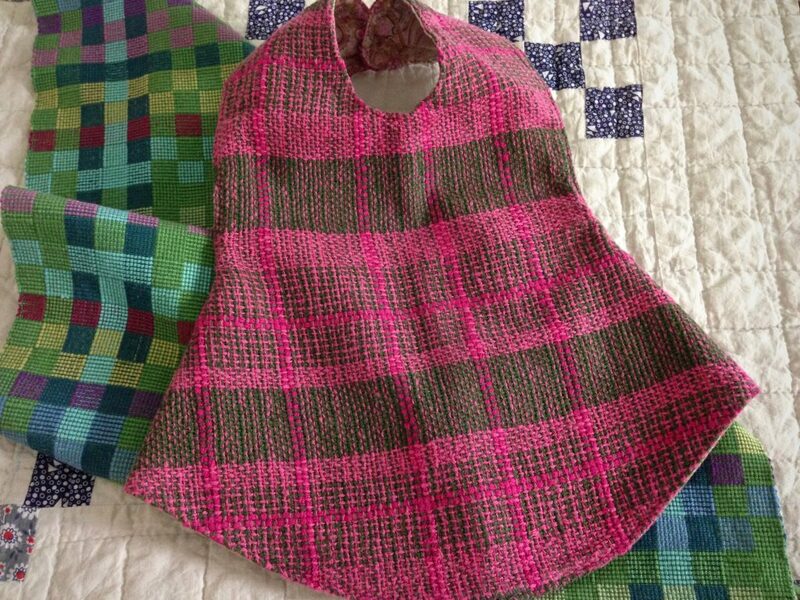 The difficult and painful process of undoing errors and making corrections is worth it when you consider the high value of the finished fabric. Monksbelt weaving continues. All is well. May you catch your errors while they can be undone. Linda, That’s a great question. 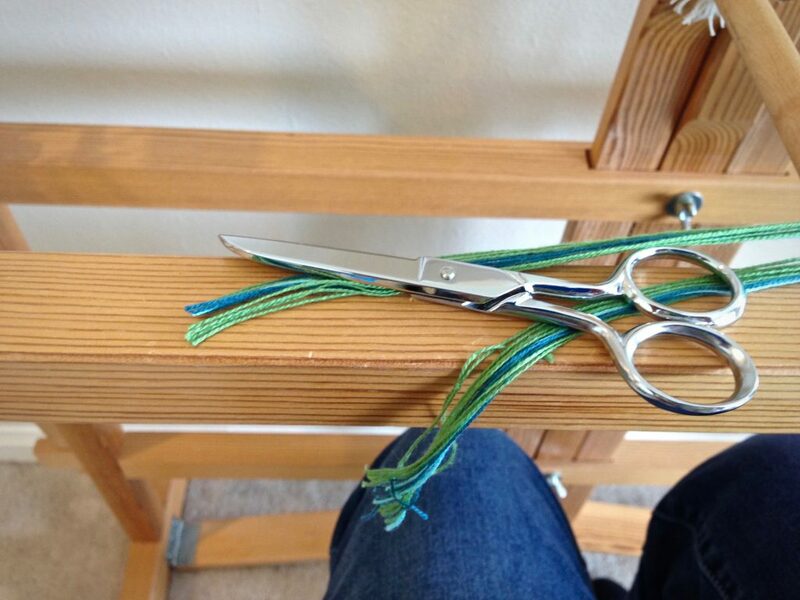 Snipping the weft does carry risk; and I did cut a warp end once doing this. The reason I do it is that removing wefts this way is less abrasive on the warp ends (arguably), especially ends at the selvedges. With this 16/2 cotton warp, I want to minimize abrasion which can lead to broken warp ends. On warps with coarser threads, I do often un-weave unless it’s very far back, in which case, clipping and pulling out wefts is faster. I don’t know if this is what you already used, but would using a seam ripper reduce the risk of cutting warp threads in this process? In sewing I feel I can better control which threads are being cut when I use a seam ripper. Elisabeth, I haven’t tried a seam ripper. I loosen the warp tension before I do the snipping, so I’m not sure if a seam ripper would do the job. I’ll try it, though. I have tried several tools–my Gingher snips, a small scissors that has a little hooked tip, and a small embroidery scissors. I like the small embroidery scissors the best, because it is very sharp and has nice pointed tips that are easy to control. What I like about the seam ripper is that I can so easilyi identify and separate the threads with the tip of the seam ripper before pushing the seam ripper throug in order to cut. I do not know anything about weaving, but I do know sewing. If you unweave instead if snip you may loosen or ruin the already perfect weave. Beautiful Karen! Ann, Yes, I see it that way, too! Dear Charlotte, what a joy to hear from you! I can imagine what fun you are having with that Structo. Yes, it would be great fun to rub elbows again. 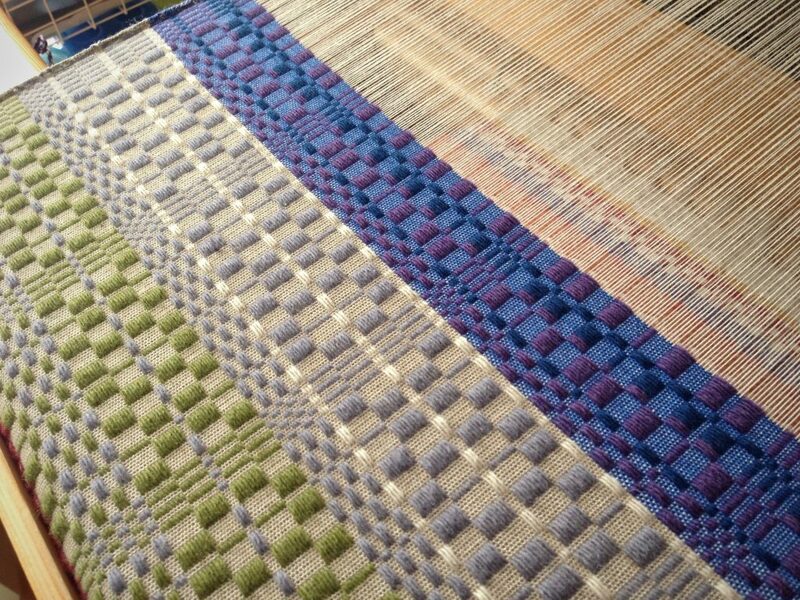 Lovely weaving and you have a trained eye to catch the mistake! It’s always nice when you catch it earlier, rather than later, and that seems to be easier the more you weave. Lovely pattern! Hi Judy, I appreciate your thoughtful words! Good point about the value of experience in being able to catch mistakes early! Thick and thin in color. The appeal for me is that something so simple can look so complex. How can plain weave do this? By having thick and thin threads that alternate in a certain way. Add color, and the options multiply! 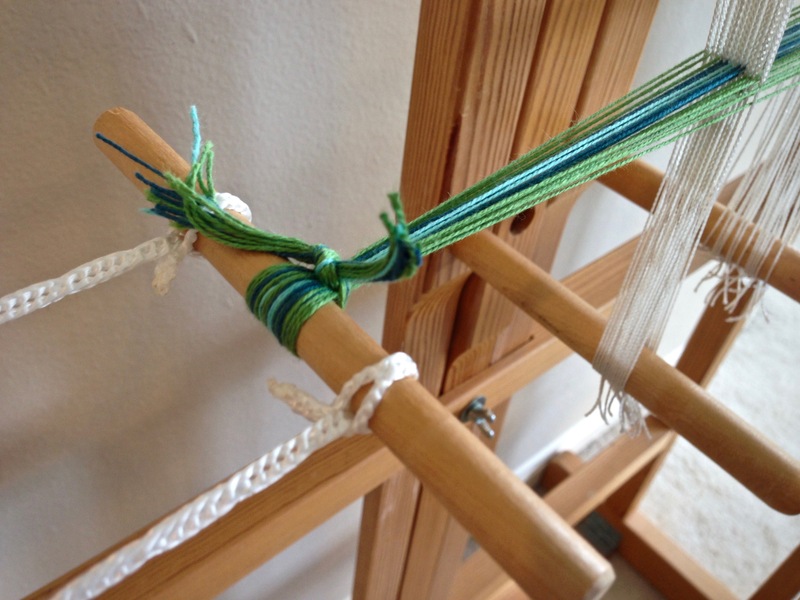 Double bobbin shuttle carries the thick weft. 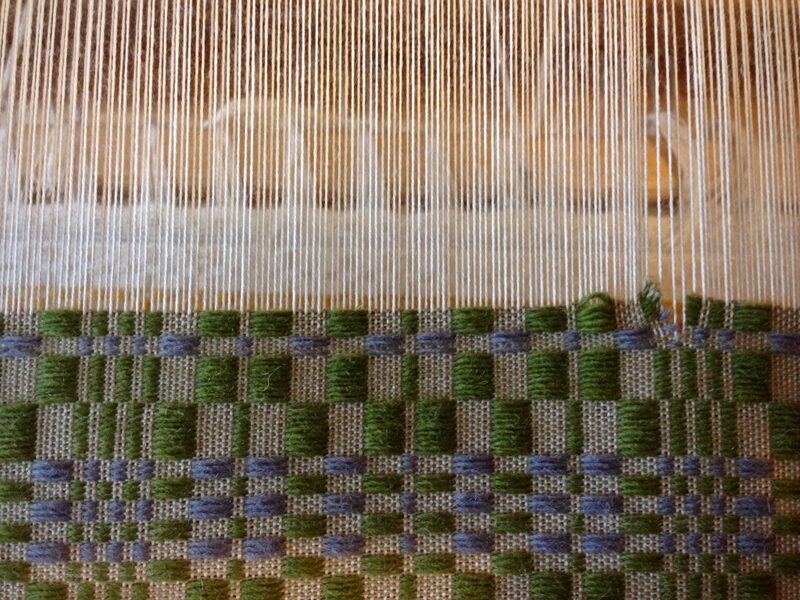 30/2 cotton for the thin weft adds texture and complexity to the plain weave. For the thin thread, I use 30/2 cotton. This very thin thread has a big impact on the fabric design. Strategically placed in the warp, it helps define the two blocks. Repeating the thin thread in a weft sequence is what produces a block change while weaving. The thin threads are integral to the design, yet they will barely be noticed after the fabric is wet-finished. It is fascinating how much impact little things have. Character is revealed in the very little things. It’s the special touch you add, the extra time you give, the kind thoughts you think. It’s how you are at home, doing ordinary things for your family. It’s who you are, what you are thinking, and what you are doing. …when no one is noticing. These are the little things that tell who we are at the core. Faithful in little; faithful in much. May all your little threads fall into place. Your piece is beautiful! Thank you for your commitment to this blog and it’s readers. We learn so much from you on so many levels. God bless you! Dear Kris, it’s my pleasure. Your kind words really touch my heart. Thank you! I LOVE these colors–beautiful, as usual! I’m glad you love the colors. 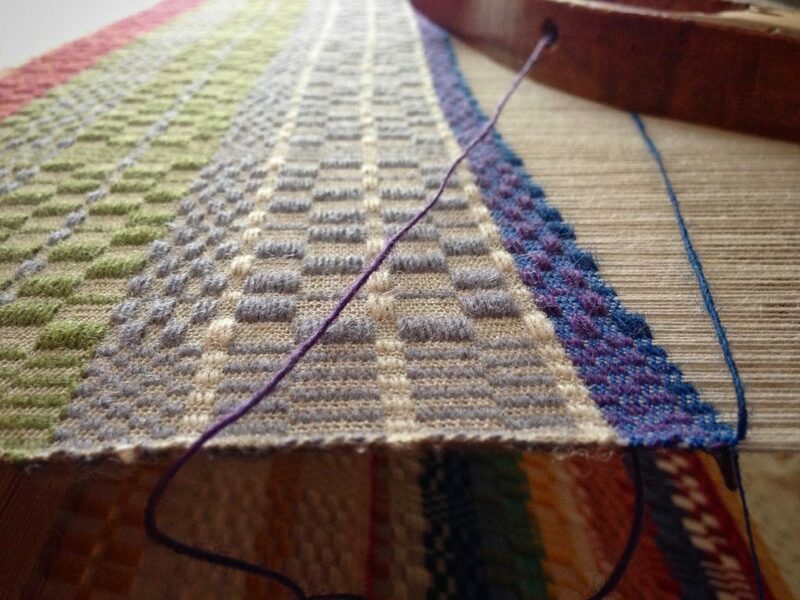 It’s always a bit of a surprise to see how the colors mix as they are woven together. 30/2 – that’s tiny! What size is the fatter fiber? The colors are spectacular! Hi Debbie, Yes, 30/2 is very fine! You don’t have to go that tiny, this works with 16/2 as well. I like the look of it with 30/2. The thick thread is doubled 8/2 cotton. 22/2 cottolin, doubled, works just as well. I’m glad you enjoy these colors! Gorgeous! Did you just thread the warp 1thick, 1thin, in a straight draw? Are you willing to share your draft? Thanks! Hi Peg, Thanks for the compliment! It is threaded as a straight draw, but the second block is formed by reversing the thick/thin order. I’m going to keep my draft under wraps for now, but The Best of Weaver’s Thick’n Thin, edited by Madelyn van der Hoogt, is a great resource as a starting point. The book has a draft for weaving towels similar to this on just two shafts! I don’t have that book, but it sounds like you threaded sort of like a log cabin. I’ll try it. Hey, what’s the worst that can happen? Yes, Peg, it’s similar to threading for log cabin. Go for it! I love the blue green combination! Someone once told me that blue and green are God’s colours. I can’t confirm this with Him personally, but I can see the grass, the trees and all the greenery, then there’s the immense sky and all the lakes, rivers and oceans, so there’s at least a possibility that there could be some truth in that saying! Hi Linda, What a delightful thought! Indeed there could be some truth in that. 1. Is there a reason you use 8/2 cotton doubled rather than 8/4 cotton, which would eliminate the need for a double bobbin shuttle, etc.? 2. Your color choices are amazing! 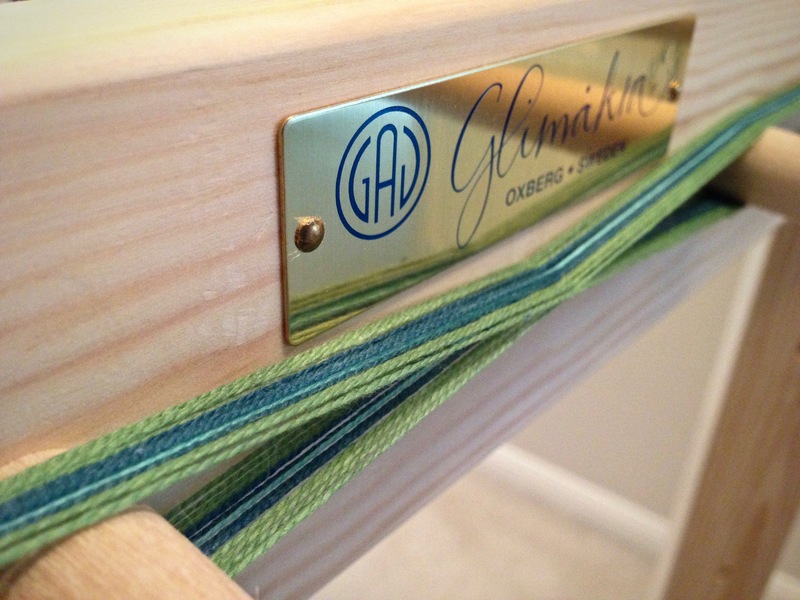 Do you use only one thin color in the warp and weft or are you varying the color of the thin yarn to match the thick? I can’t quite tell from the photo. Love your thoughtful and well written blog. I’m just a hobby weaver (just weave things for myself and as gifts) but your website is so inspirational. 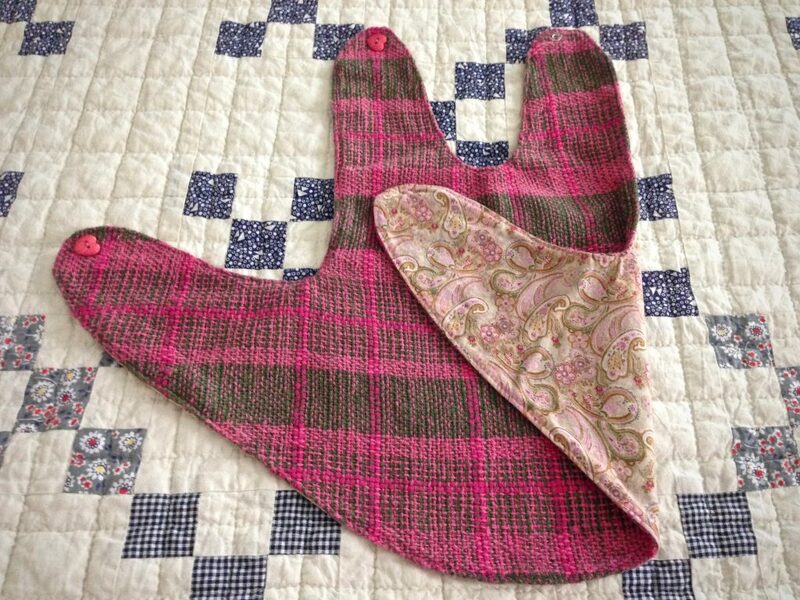 BTW, have you ever thought about using your same thick and thin technique to weave a soft cotton baby blanket? Thanks again for sharing your expertise!! 1. The Swedish yarns that I use come in 8/2 and not in 8/4. I don’t know for a fact because I haven’t tried to compare it, but I believe that 2 threads side-by-side will produce a more supple cloth. 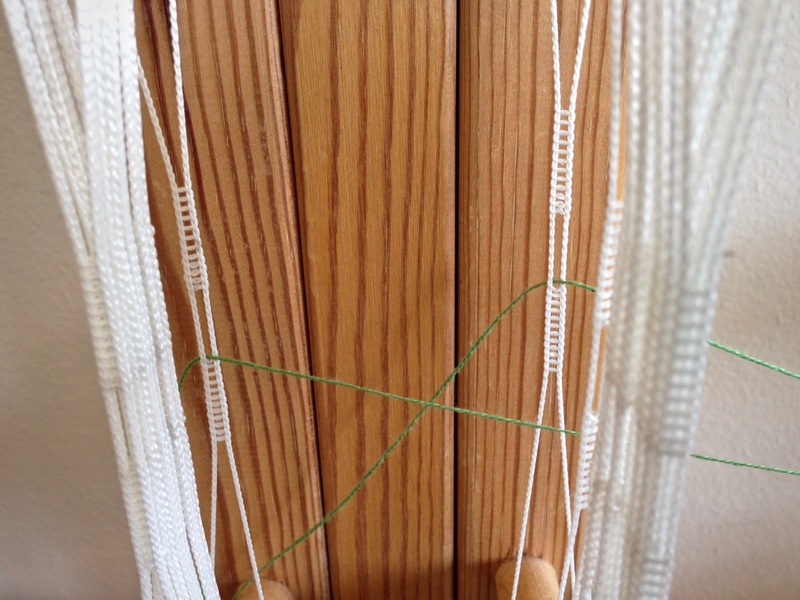 Without a double bobbin shuttle, you can throw the shuttle across and back, catching the selvedge thread at the turn. I did this the first time I wove thick and thin a few years ago. I definitely prefer the double bobbin shuttle – for time’s sake, and for avoiding excessive wear on selvedge threads. Some weavers would use a floating selvedge to do this. I’m not one of them. 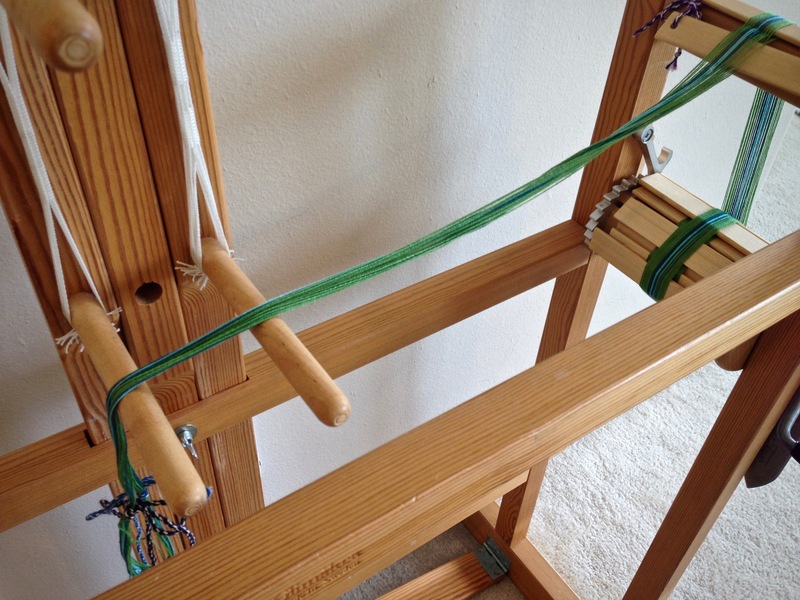 I have heard that you can put two short bobbins in a large shuttle, with a bead in between, to use as a double bobbin shuttle, but I haven’t tried that. 2. 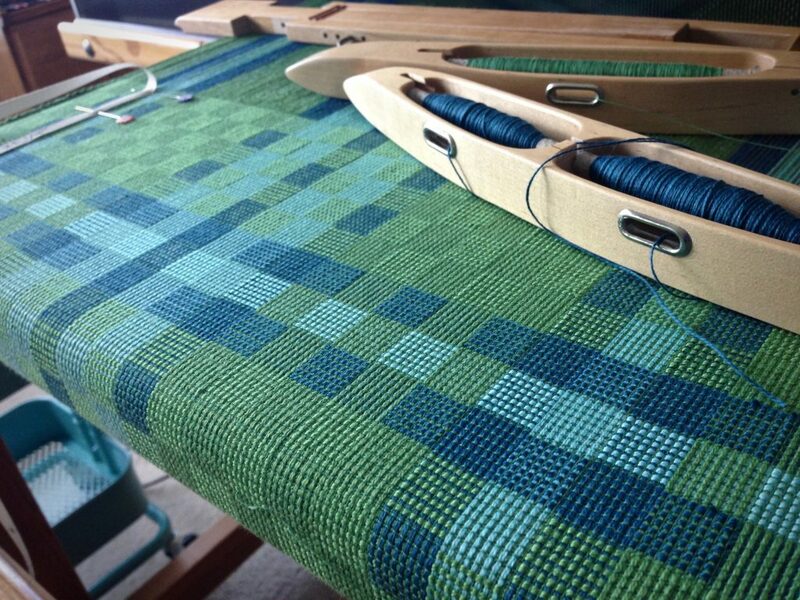 I have only one color of the thin yarn (green) that I use in both warp and weft. I purposely chose a dark color that would blend with the other colors. I was hoping that a dark color would help to outline the blocks, which I think it did. The thin thread is 30/2 cotton. The only place I could find it in colors is Vavstuga.com, with their Borgs cotton. Have I thought of thick and thin for a baby blanket? Have I ever! My daughter is expecting her first baby this summer, so, yes, I have thinking about how sweet this would be for a baby blanket. I have a colorful sample piece from the end of the warp that I’m going to use to make something for the baby. Thanks for stepping in to ask questions. Let me know if you have any more! Thanks for the prompt and really interesting responses. I’m going to think about this question of 8/2 x 2 versus 8/4. Clearly the two 8/2 threads can lie next to each other which would be different from 8/4. I may have to so some sampling one of these days. I can’t wait to see what you come up with in the baby blanket department. Go Grandma! I’d love to hear the results of your sampling, if you do that. Please keep me posted on what you discover. I recently started following your blog and love your thick and thin towels. I am a RH weaver and have woven a few towels but needed some inspiration on my next set. Your zebra towels hit the mark for me. On my RH I think I will interpret them as log cabin threading with 2-10 dent heddles using 8/2 unmercerized cotton for both warp and weft. My question to you is if you think I should also double every other thread for the thick and thin effect. Any other suggestions for adapting to the towels to a RH? The only other thin yarn I own is a 10/2 perle cotton. 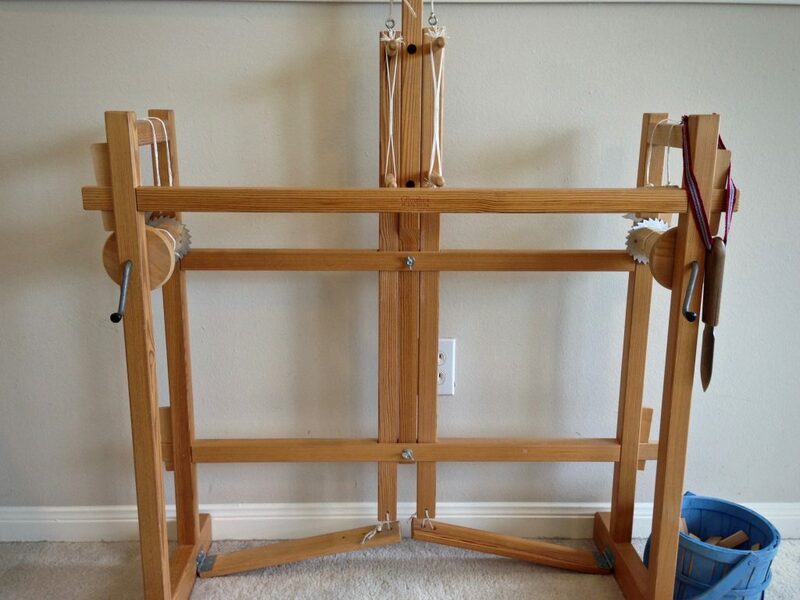 Laurice, This is a perfect project for the rigid heddle loom because it can be woven on two shafts. You will get the most out of this weave if you have a good contrast between thick and thin threads. Yes, you could double every other thread for the thick/thin effect. If you have enough 10/2 perle cotton, I would use that for the thin threads, and I would double the 8/2 cotton for the thick. I think you will get stunning results with that combination. The thick/thin pattern variations are produced by reversing the order of thick and thin. Where thick or thin are placed consecutively, the pattern reverses. i.e., thick-thin-thick-thin-thick-thin//thin-thick-thin-thick-thin-thick//thick-thin-thick-thin-thick-thin, etc. This is true for the warp threading and for the weft order in weaving. Please keep me posted. 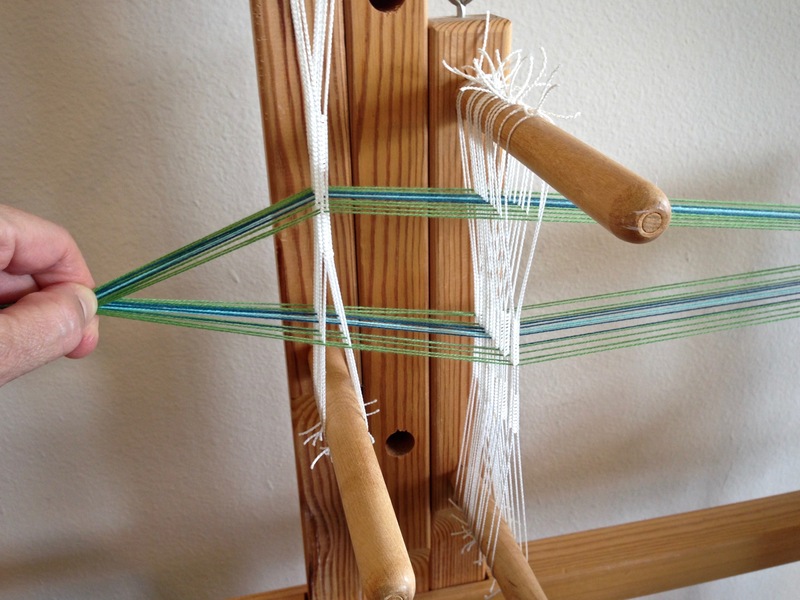 I would love to hear how this works out for you on the rigid heddle loom! Sounds like fun! My challenge is on thanks to your encouragement. One thing I’d also like to verify is that in your zebra towels your thin yarn was only in white. In trying to look at your threading it appears that in the black stripe the doubled yarn was in black and the white was the single. Thanks so much for sharing your thoughts! Laurice, you are correct. In the zebra towels the thin thread is white, exclusively. The thick thread is doubled black or doubled white. I’m over here cheering you on. Go for it!